To connect your Iridium 9505A satellite phone to your computer you will need this adapter. It will provide a serial (RS232) connection on the phone allowing you to connect a cable to transmit and receive data (requires computer configuration). 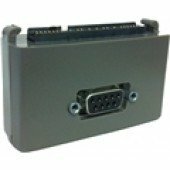 Connect RS232 serial cable (sold separately) to RS232 port on adapter and connect 9505A serial connector to 9505A bottom connector. Requires installation instructions and computer configuration to transmit and receive data.